I have so many things to do around here and I haven’t been feeling well. I was sure that I didn’t want to wax Lion yesterday, but since it takes two days to accomplish, I had to start yesterday and finish today. Once the Tylenol kicked in it wasn’t so bad. I may have even figured out how to do his legs so I don’t leave bruises. That doesn’t mean I want to do his whole leg. I did from mid-thigh up. The front side of the Lion is fur free. Today I tackle the back side. Generally there’s less fur so I hope it will go more quickly. 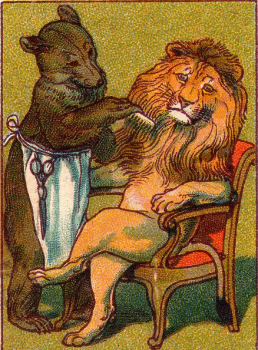 During our waxing session, with Lion pointing out places I missed and which way I should pull the wax to get that hair, I told him he’s high maintenance. I’ve thought it for a while, especially when it comes to hair removal, but I don’t think I actually ever said it. It’s not necessarily a complaint, although he’ll take it as one. I consider him high maintenance sometimes when he wants to go out for dinner and I don’t. Or if he insists on doing something a certain way. My way would have been just as good, but we had to get there his way. I like to think of myself as low maintenance. I don’t spend hours in the bathroom getting ready. From beginning to end, I can get be out the door in as little as ten minutes if I need to. I’ve showered the night before. We both do. All I need to do is brush my teeth, get dressed, brush my hair, put on deodorant, grab my phone and keys, and I’m set. What’s for dinner? Soup. Sandwich. Eggs. Works for me. Lion’s lament that there’s nothing to eat usually means there’s nothing here he wants to eat. We could survive off the food in the freezer for weeks if nothing had to match with anything else. Hot dogs with hash browns? Why not? Maybe my low maintenance is actually high maintenance from Lion’s point of view. He apologizes when I’m ready first because he thinks he’s slowing me down. Most of the time he’s not. When he says, “There’s just one more thing I need to do”, that slows me down. Let’s put that in perspective though. Getting ready implies we’re going out. Going out is generally something I’d rather not do. I’m a homebody. The longer it takes us to get out, the longer it takes us to get back. Should we stop somewhere for lunch? We could eat home. What’s at home to eat? There’s nothing to eat. Yes, you guessed it. This is just one more way we’re different. It’s a good thing we let our love develop organically. If we had done any charts with pros on one side and cons on the other, we’d never have gotten together. Later on, I’ll wax the back side of my high maintenance Lion. The laundry will get done. I don’t know how much of the rest of the list will be crossed off, but we’ll deal with that organically too.